Running Press Adult, 9780762446049, 256pp. Consider this your invitation to world's greatest cheese party! Peek behind Philadelphia's largest and oldest cheese counter for a lively guide to pairing cheese with everything from beer and cocktails to olives and charcuterie. The store's resident cheese blogger, Madame Fromage, brings to life 170 of the world's greatest artisan cheeses, drawing on stories and knowledge from the store's third-generation owners. Accessible for cheese newcomers and connoisseurs alike, this guidebook breaks down the mysterious world of cheese into personality profiles like "Baby faces," "Vixens," "Mountain Men," "Stinkers," and "Pierced Punks," sliding along a scale of texture, age, and pungency. These cheeses are then paired off for occasions like Cocktails & Nosh, Cheese for One, Book Club Cheese Night, and Craft Beers & Artistan All-Stars. Also included are 30 recipes, from Zeke's Bacon Maple Grilled Cheese to Cheddar Ale Soup; an extensive dairy lexicon; and notes on how to taste cheese like a cheesemonger. Part recipe book, part family history, part cheese encyclopedia, Di Bruno Bros. House of Cheese is a fresh, new take on a favorite food group. "Ever since I was a child I've always been obsessed with cheese. I remember going down to South Philadelphia to Di Bruno Bros. and picking out provolone with my grandfather. These days, there's a lot more than provolone out there, and it's great to see that it's still Di Bruno Bros. forging ahead, helping people understand cheese. Whether it's variety, history, technique, or flavor combinations...this book has it all. I've relied on these guys for my whole life...and it just got easier for the rest of the world!" "Full of authoritative and engaging advice on how to use cheese that should appeal to all levels of knowledge...portraits so luscious, you can practically feel the creaminess of each blue wedge melt on your tongue. I can smell the piquant perspiration of that well-aged Testun al Barolo. More important, Darlington's prose brings it all to life." "This book has it all--history, family, and a working encyclopedia of cheese." 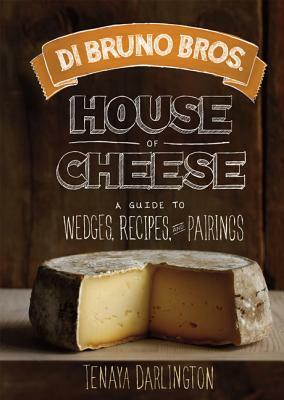 "A must-have for anyone aiming to craft the ideal cheese plate, find the perfect drink pairing, or bring the atmosphere of the Italian Market Di Bruno Bros. to his or her kitchen."